Yep, today’s the day my second book, FADE TO WHITE, hits the stores. As all of you know, I looooove to ski. Well, I love to write, too. So during the off season, when there’s no skiing to be done, I get myself through by writing about skiing. It’s the perfect intersection of two passions for me, and great therapy for a ski addict in withdrawal. Last year, the result was DOUBLE BLACK: A SKI DIVA MYSTERY. 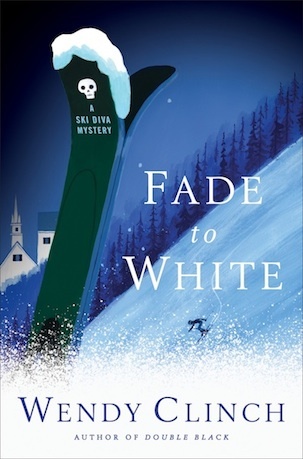 This time it’s FADE TO WHITE, the second in my Ski Diva mystery series. Yes, it features the same main character: Stacey Curtis, ex-grad student turned ski bum/bartender, as well as some other familiar faces from DOUBLE BLACK: Chip, the hunky ski patroller; Guy Ramsey, local sherrif and Stacey’s landlord; and Tina Montero, massage therapist and barfly. But there are some new characters, too. Stacey’s cheating ex-fiance, Brian, makes an appearance, as does Harper Stone, a washed-up movie actor who’s come to Stacey’s ski town to film a mouthwash commercial (and is anything but happy about it). There’s also Buddy Frommer, local ski shop owner and drug dealer, and film director Manny Seville, who’s crossed paths with Harper Stone before. FADE TO WHITE finds Stacey up past her ski boots in yet another murder. When Stacey and Chip find Stone’s body during a late night ski date, Stacey ends up trying to find out who killed him and why. It’s Hollywood meets the Green Mountain State, and the result is hilarious culture clash, as well a plenty of intrigue and excitement. Clinch’s enchanting second Ski Diva mystery (after 2010’s Double Black) opens on a crispy day under a cloudless blue sky, a winter rarity in Vermont. Avid skier Stacey Curtis plans to take full advantage of it by spending the day on the slopes of Spruce Peak before she reports for her night job in the Broken Binding, a local bar. Unfortunately, the lift line is closed due to the filming of a commercial, and to complicate matters, her ex-fiance, Brian Russell, is supervising the shoot. Later, when a snowstorm makes conditions on the the slopes perfect, ski patrol friend Chip Walsh joins Stacey for some spectacular night skiing– spectacular at least until she hits something that turns out to be a dead body. Stacey once again turns sleuth in a fast read sure to appeal to skiers and nonskiers alike. I had a blast writing FADE TO WHITE, and I think you’ll have fun reading it, too. Signed copies are available from Northshire Books in Manchester Center, VT, or The Book Nook in Ludlow, VT. For more about both books, go to wendyclinch.com. Congratulations Wendy! Happy New Year!